The apology cake photos were posted on Imgur, as part of Budweiser's Give a Damn campaign to fight drunk driving. The morning after the Super Bowl, Budweiser took to Imgur with a campaign that featured cakes adorned with apologies aimed at designated drivers who had escorted drunk friends home from Super Bowl parties. The activation came as part of Budweiser's Give a Damn campaign, an endeavor to fight against the hazards of drunk driving. The cakes feature humorous apologies on behalf of invented Super Bowl party-goers who might have taken the festivities a bit too far the night before. Budweiser chose Imgur, an online image-sharing community made up primarily of Millennial males, to host the apology cake photos. The social campaign helped applaud designated drivers and add levity to responsible drinking efforts during the Super Bowl - one of the biggest drinking days on the U.S. calendar. Budweiser and VaynerMedia took to Imgur to support Budweiser's overarching Give a Damn campaign, which aims to end drunk driving. As part of the initiative, Budweiser created a Super Bowl spot starring actress Helen Mirren and partnered with Twitter to promote safe ride programs. But the Imgur element of the campaign was aimed at the morning after the Super Bowl. The campaign team worked to build content that would resonate with the Imgur audience, eventually settling on the idea of the apology cakes for designated drivers who got friends home safely after the Super Bowl. "At the end of the day, the apology cakes were one component that helped us generate as many conversations as possible about drunk driving," said Azania Andrews, senior director, digital connections North America at Anheuser-Busch InBev, Budweiser’s parent company. "The more people we got talking about this issue, the more likely they’d make a plan to get home safely next time they’re out." 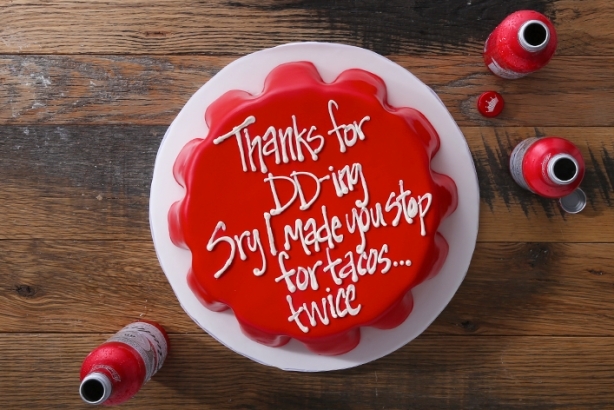 The campaign team developed the phrases on the apology cakes by seeking to find a balance between capturing Budweiser's brand voice and the Give a Damn campaign tone. VaynerMedia also collaborated with Imgur's creative team to ensure that the lines felt native to the platform's audience. One cake even featured a shout out to Sarah Schaaf, Imgur's director of community. The cakes were baked by a local Manhattan bakery and the photos were taken at VaynerMedia's in-house studio. The apology cake pictures were posted to the Imgur community the morning following the Super Bowl. The engagement rate of the apology cake photos among the Imgur community on day one was 1.54%. For reference, there are over 130 million unique visitors per month on Imgur and over 1.5 million images posted daily on the platform. The campaign also saw an 85% positive sentiment response from the Imgur community. Budweiser's #GiveADamn campaign was the first packaged goods campaign to run on Imgur to date. "We're proud of the ability to continue the conversation about the seriousness of drunk driving in a unique way to our target audience," said Andrews. "We're also proud of the response from the Imgur community who were receptive to our content."